Damien Abbott BSc, FRICS, AAI, LRPS has specialised in real estate since 1966. He is a graduate of the University of London. His experience has been gained in over twenty countries spread over five continents. He has worked with such prestigious companies as Abu Dhabi Investment Authority, CB Richard Ellis, Ford Motor Company, Land Securities and INVESTCORP International. He has lived and worked in Abu Dhabi, Brisbane, Brussels, London, Istanbul, New York, Sydney and San Francisco. Damien Abbott's extensive experience, over more than 40 years, has involved development, investment, appraisal, management and financing of real estate with a total present-day value in excess of $3.0 billion dollars. His work has taken him from new town development to real estate financing, development and investment extending to over 20 countries. This has included such diverse responsibilities as appraisal work in Cairo and Damascus; condominium development in California; acquiring or financing office investments and shopping centers in London, Boston, Washington D.C., Los Angeles, Brussels and Paris, and industrial development in Dublin, Ireland and Pori, Finland; as well as collateralized-mortgage financing for Saks Fifth Avenue. Damien now spends most of his time writing, updating the Online version of the Encyclopedia, traveling to research material for the Encyclopedia, and the International Real Estate Research website. Damien is a Licentiate of the Royal Photographic Society and is taking photographs and writing a new book on Tall Buildings around the world. Damien is the author of the Encyclopedia of Real Estate Terms, a director of Delta Alpha Publishing and a Licentiate of the Royal Photographic Society. He is regularly updating the ONLINE version of the Encyclopedia of Real Estate Terms (Real Estate Defined), as well as writing a blog on real estate definitions (http://realestatedefined.com/blog). Damien is also a photographer who is writing and assembling images for a book on tall buildings around the world. After a recent trip to Hong Kong and China (Shenzhen, Guangzhou & Tianjin), and Southern Spain, he is planning further trips to the United States, France, Germany and Scandinavia. In 1994 Damien left INVESTCORP and lived and worked in Turkey for 10 months. At that time he acted as consultant to CB Richard Ellis. He then moved to San Francisco to set up Delta Alpha Publishing and write the Second Edition of the Encyclopedia of Real Estate Terms. From 1998 he returned to London and continued to act as a consultant to CBRE in Istanbul. 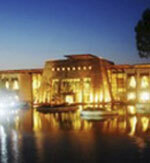 He provided consultancy advice for valuations and investments in Turkey, Egypt, Syria and Mauritius. This included work for the governments of the United States, Australia and advice on land tenure in Mauritius. Investcorp was founded in 1982 to source investments that were to be placed with investors in the six Gulf Co-operation Council countries of the Arabian Gulf. Damien joined Investcorp in 1984 and he worked in its London and New York offices. During his 10 years at Investcorp he arranged some US$750m of real estate financing and investment. This included the sale of Investcorp's first investment, ManuLife Plaza, to Nomura. Refinancing and management of the Packard Building in Philadelphia. Development of condominiums at Lombardia and Montaire in San Francisco. Development of a first-class apartment project at Beverly House, Park Road, London. Development of a prestige office building at Herald Square Building at 1250 H Street, Washington, D.C. and Dominion Point, Reston, Virginia. Sale of the Gucci building, Bond Street, London to Matsushita. The collaterized-mortgage of the Saks Fifth Avenue real estate portfolio. The Abu Dhabi Investment Authority was established in 1975 to invest surplus funds from the oil revenues of Abu Dhabi. It is a premier global institutional investor with the mission of securing and maintaining the current and future prosperity of the Emirate of Abu Dhabi. Its investments include an international real estate portfolio. Damien was recruited in 1978 to work in Abu Dhabi. He was responsible for setting up a portfolio management system to monitor the Authority's real estate investments. This included monitoring diversification, returns and the reports received from the local managing agents. He also advised on new investments, which included offices in the UK and United States and a shopping centre in Paris. He moved to London in 1980 to take responsibility for the management of the Authority's European portfolio. Damien joined Ford of Europe in Warley, England in 1976. He was responsible for the development of new dealership facilities in Europe. This involved finding sites, obtaining zoning approvals and developing facilities in Finland, Sweden and the Republic of Ireland. In addition, he provided property advice for the developement of dealership facilities in the UK, Belgium, Denmark, the Netherlands, Norway and France. Richard Ellis was founded in 1878 in London and has grown to be one of the global leader in real estate services. Damien joined the Brussels office in 1973. He was responsible for advising international real estate firms on office, retail and industrial development and investment properties throughout Belgium. The work ranged from viability analysis, property acquisition and financing to sales and leasing. Clients included Commercial Union, Heron, Slough Estates, Grosvenor Square Properties, the Property Fund Unit Trust and Law Land. Land Securities is the largest property company in the UK. Damien joined its subsidiary Ravenseft Properties in 1971. He was responsible for managing over 300 properties in the City of Birmingham and across the Midlands. The property portfolio included shopping centres, offices and industrial buildings. Redditch was officially designated as a New Town in 1964 with the aim of increasing the population from 30,000 to 80,000. Most of the new residents came from Birmingham and other towns of the West Midlands. The New Town was designed so that people could live and work in Redditch with the provision of new factories, shopping facilities and modern housing. Damien joined the Redditch Development Corporation in 1967 when the plans had been drawn up but no new buildings had been completed. By the time he left in 1971, the Corporation had built over 1,000 houses, 1m sq. ft. of industrial space and completed phase I of the town centre, the 'Kingfisher Centre'.